Is God Male, Female, or Both? The complete conception of God includes God and His energies, which exist simultaneously with Him and are in a sense identical to Him. The sum of Krishna's energies is Radha, His eternal consort. Like the sun and sunshine, Krishna and Radha are one. Radha embodies the totality of love for Krishna. Thus She is known as the personification of Bhakti, or loving devotion to God. 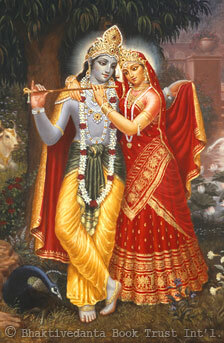 Radha-Krishna are the male and female aspects of God. Known as the Divine Couple, together they are the full manifestation of God.